A couple of years ago I occupied myself while Michelle was recovering from cancer treatment by finally organizing the 5000 odd baseball cards I had in boxes in the closet. At the time I thought I was just making use of the downtime to downsize a bit since we were moving to a smaller place. Now I wonder if there wasn't more to it, but the psycho-analyzing will have to wait for another time. Ultimately, I threw away a bunch of worthless mid 80's baseball cards that my brother had collected, including his attempts to stockpile rookie cards of future stars while they were cheap. Seriously dude, 20 rookie Phil Plantier cards? (Note - all mid 80s baseball cards are worthless because they printed 50 trillion of them) I ended up with 4 binders of years 77-80 Topps cards, all sorted numerically, with the idea when we had more disposable income I'd complete my sets, even though the completed sets would be worth less than the plastic protector sheets I bought to display them, plus a couple of boxes of assorted cards, doubles, etc. We have more disposable income, and several times in the last few months I've pulled out the 77 binder, which is closest to a full set and pretty quickly put it back. What's important about the cards isn't actually the cards. It's the memories associated with the cards. My Aunt would send me pack of cards every couple of weeks, I still remember the the joy in getting those envelopes, even if she did remove the cards from the wax pack and throw the gum away. I remember many hours with my friends trading cards, gambling with them by flipping them against the wall, and even playing a weird home brew version of Strat-O-Matic or APBA baseball with the cards. Needless to say, none of my cards are in mint condition, which is the only way a mid-70s baseball card can be worth significant money. The golden age of baseball cards, from a value standpoint, ends about 1972. Unfortunately we never found my dad's mythical collection full of Ted Williams and Mickey Mantle cards. As we start to prepare to upgrade our living situation a bit I was faced with making a decision about the cards. Do I pack them up and haul them to the new place, or do I say goodbye while knowing the memories are always mine? I sold them on Facebook Marketplace last night for $100. 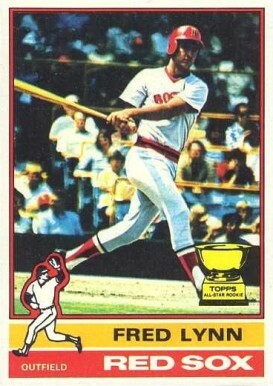 If you are wondering why I used a Fred Lynn card for the image, he was my first favorite baseball player. I started following baseball closely in 1975 - with the Red Sox improbable World Series run and Fred's amazing Rookie of The Year / MVP season. I think he is still the only player to do that.